When Mary Anne Glowacz was contacted about appearing in a public service announcement for the upcoming Dunkin’ Donuts Cop on a Rooftop events, she had only one request – she’d do it as long as her friend Ela Stoklosa could do it with her. 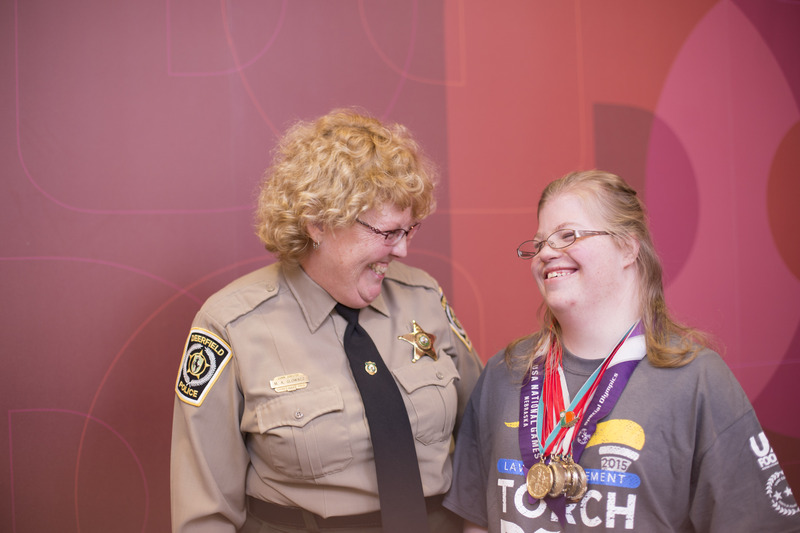 So, together they poured out their love for Special Olympics and the Law Enforcement Torch Run for the cameras on April 2 at the Dunkin’ location at 499 Lake Cook Road in Deerfield, where Glowacz will again be raising money for Special Olympics athletes on May 29. “The Cop on a Rooftop event is a lot of fun. It let us (law enforcement) make fun of ourselves,” said Glowacz, referring to the long-held assumption that officers eat a lot of donuts. Glowacz has been involved with the Law Enforcement Torch Run for about 8 years, when she took over the LETR position for her department. That first year, they were asked to participate in Cop on a Rooftop event and she admits “I was terrified – would it be a success?” But, she found “it’s the easiest thing to get folks involved in!” Now, each year her department tries to outdo itself by increasing the amount raised. Through the years, Glowacz and the dispatchers at her department have become good friends with Ela and her family. “Her parents and siblings come with Ela to help out at many of our fundraisers,” Glowacz said. Join Mary Ann Glowacz, Ela Stoklosa and all the law enforcement officers and athletes around the state on May 29 at a Dunkin’ Donuts near you. See list of locations here.